Realistically, the Fed has no direct control over the country’s inflation, GDP, or employment. Instead, it has to utilize monetary policy tools, like an adjustment to the federal funds rate, to affect the aforementioned economic variables indirectly. It must use the rate to stimulate or slow the economy, as well as the tool of adjusting the availability and cost of money and credit, so as to promote a strong and healthy economy. Congress has actually mandated two policy goals for the Fed: 1) pursue and maintain the maximum sustainable economic output and employment and 2) stabilize prices and inflation. The Fed funds rate is the interest rate institutions charge one another for overnight loans of reserves and all other loans are generated from that basis. The Fed manipulates the total amount of money and credit in the economy and the funds rate eventually affects long-term interest rates. Ultimately, this empowers the Fed to affect output, employment and inflation. While the Fed was buying securities, to the tune of $4.5 trillion, through their open market operations, they were essentially creating money, by crediting the reserve accounts of the banks selling the securities. According to the basic principle of supply and demand, the additional money puts downward pressure on the federal funds rate. The logic is that lower interest rates encourage business and consumer spending, thereby stimulating economic activity. 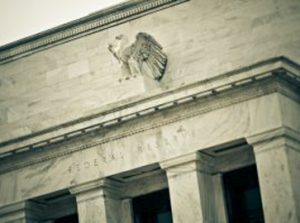 Economists generally agree that in order for the Fed to stave off the leading edge of a recession, at least a 3% rate decrease needs to be available and the current rate makes less than half of that available without going to negative interest rates, which has been proven to be a complete failure on the global stage. So, in spite of having used all the monetary policy “arrows” in their quiver, the Fed finds itself painted into a corner. As much as they talk about continuing to increase interest rates and as much as they talk about implementing a sell schedule to begin reducing balance sheet liabilities, the reality is that the economy simply can’t handle it. If they do pursue that course, the national debt will grow at a faster pace, business and consumer spending will slow, and as a result inflationary pressure which is already missing Fed targets on the low side will continue to lessen. As much as the Fed and other central banks bad-mouth gold whenever possible, it’s important to realize that global central banks have been among the greatest purchasers of gold over the past couple of years and many emerging countries have taken notice and are following suit. Continued economic tightening on the part of the Fed without appropriate inflationary support will force the economy to slow, which will only serve to destabilize the equity market and potentially trigger a depression, with absolutely nothing left in the Fed quiver. The best protection from any possible type of cataclysmic economic scenario is physical precious metals ownership. Protect your financial legacy. Call the experts at American Bullion (800) 653-4653 for immediate assistance.